A watchdog group on Tuesday field a complaint with the Federal Election Commission over donations from Democratic National Committee chair Tom Perez's campaign account to former opponents who had sought the top DNC post. The Foundation for Accountability and Civic Trust, or FACT, filed the complaint, alleging the donations may have been illegal, Fox News reports. The allegation is that Perez's team only made the donations to his opponents after they dropped their bids for DNC chair and then supported Perez. "There is no doubt that at the time Chairman Perez donated or transferred the funds, he was an agent of the DNC, the funds were related to the DNC, and the DNC's response to the donation demonstrates Perez was acting on the DNC's behalf," the complaint reads. "Allowing this behavior to go unpunished opens the door for a new level of corruption in party elections—offering campaign cash for support from former opponents. The Commission must immediately investigate and enforce the law." 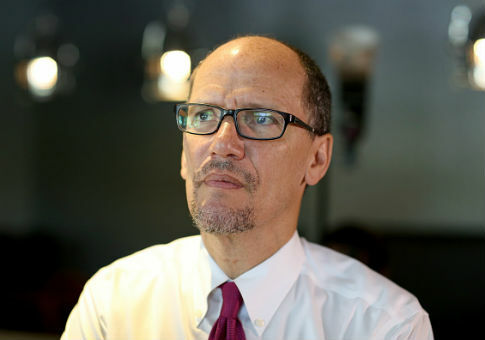 The complaint maintains that Perez used non-federal funds, which would not be legal for the DNC in this case, according to Fox News. FACT's complaint stated that under the law, national party committees and agents are only allowed to make disbursement from a federal funds account, and to "avoid corruption and circumventing the law," national party committees are "prohibited" from using non-federal funds. FACT alleges Perez's donations were made with non-federal funds. "The laws applicable in this case exist to prevent political extortion and corruption, which is why the Supreme Court has explained the importance of the Act's applicability to national party committees and party officers," FACT Executive Director Kendra Arnold told Fox News. "Therefore, we are calling on the FEC to immediately investigate and enforce the law because allowing this behavior to go unpunished opens the door for a new level of corruption in party elections, namely offering campaign cash for support from former opponents." DNC spokesman Michael Tyler denied the allegations as a "partisan nuisance complaint." This entry was posted in Politics and tagged DNC, FEC, Tom Perez. Bookmark the permalink.